We would like to invite you to the 15th anniversary of biggest building fair of Thuringia “JENA 2019 – BUILD-LIVING- ENERGY”. Also this year the company LUCAS presents your LED products in the Sparkassenarena Jena in hall 1, F/006. For this purpose, we gladly send you a ticket to. Please contact us. Together with three regional partners, LUCAS is developing an antibacterial photodynamic system for the prevention of respiratory-associated pneumonia. We would like to invite you to the 13th biggest building fair of Thuringia “JENA 2017 – BUILD-LIVING- ENERGY”. 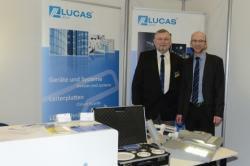 Also this year the company LUCAS presents your LED products in the Sparkassenarena Jena in hall 1, F/028. Since March 2017, LUCAS has been working on the project “3D Music”. The system is intended to capture movements of disabled or immobile people using 3D measuring methods and convert them into sound music. This year's „ThEGA-Forum 2016“ was dedicated to “energy revolution in transition”. This year LUCAS introduced to the trade visitors its energy-efficient street lighting with modern LED technology. Once again LUCAS will exhibit at the 12th biggest building fair of Thuringia “JENA 2016 – BUILD-LIVING- ENERGY”. Please look and see our LED products at your visit in our booth in the Sparkassenarena Jena in hall 1, F/02. LUCAS expands its supplier portfolio around the PCB: From single-sided boards up to HDI-PCBs, from rigid boards over flexible to rigid flex boards and from CEM1 over FR4 to Metalclad boards. Several PCB manufacturers were certified by LUCAS in December 2015. Stadtwerke Jena organized the 18th energy talks on street lighting in Jena. LUCAS presented saving and control possibilities by modern LED technology. In the foyer of Stadtwerke a “light street” was built up to show practical comparison of different types of lamps (LED, sodium vapor, metal halide…) www.jenatv.de/mediathek/31529/Lampenwechsel_Die_Stadt_setzt_bei_der_Strassenbeleuchtung_auf_LED_Technik.html. In the new Technology and Innovation Park Jena LUCAS presented the energy-efficient street lamp LUCS with the transmission and control system LED-Commander based on powerline in a current pilot project in cooperation with city government of Jena. www.bvmw.de. LUCAS will be exhibiting at 11th Spring Fair “JENA 2015 – BUILD-LIVING- ENERGY”. We look forward to your visit to Sparkassenarena. 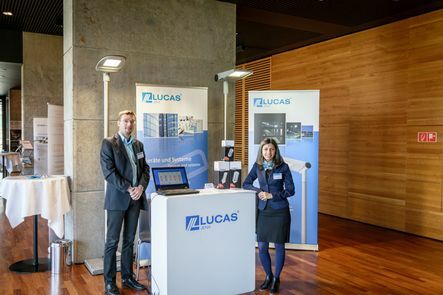 On the occasion of the “International Year of Light” of the United Nations in 2015 introduces LUCAS in the Goethe Galerie Jena with more than 30 members and partners of OptoNet e.V. innovative LED street lights www.optonet-jena.de. LUCAS is official sponsor of basketball team “Science City Jena” www.baskets-jena.de. LUCAS will be exhibiting at 4. Industry days in Jena. We look forward to your visit to Jena www.jenaer-industrietage.de. A promising project for crime investigation: together with six European partners LUCAS starts the project “3D-Forensics”, the development of a mobile high-resolution 3D-Scanner and 3D data analysis for forensic evidence www.3d-forensics.de. LUCAS and partner Opulent will be exhibiting at electronica. We look forward to your visit to Munich at hall B1 / booth 364. SMT Hybrid Packaging – We're in! LUCAS and partner Opulent will be exhibiting at Europe´s leading event on System Integration in Micro Electronics. Upon request, we send you our entry voucher. Light+Building: the world's largest trade fair for lighting and integrated building exspects you in Frankfurt am Main. We, LUCAS and Opulent, are back again and we are looking forward to your visit in hall 4.2 / booth K37. Under the theme of the exhibition “Energy efficiency”, we would like to introduce our performance products: LED Modules, High Power LED solutions, OLED, Powerline Controls, LED-Commander, etc. Successfully completed recertification – again LUCAS has been certificated according DIN EN ISO 9001:2008. The certificate is valid until the end of 2014. We thank all colleagues for the smooth running.